View More In Steamers, Stock & Pasta Pots - Page 2. Sunsella's premium quality 100% stainless steel vegetable steamer is a great way to get the best out of your fruit and veggies retaining all the nutrients and minerals lost by other cooking methods. Fantastic for family meals or single serves, this steamer will quickly become one of your favorite kitchen gadgets. Perfect for steaming fruit and vegetables for making baby food. - Unique, compact, collapsible design for space saving storage. - High grade stainless steel construction. - Expands and adjusts to fit a variety of pots and pans. - Sturdy stainless steel legs that wont rust like the cheaper aluminum versions. - Easy removal from pan with custom designed central ring. - Center post and legs attached. No assembly required, ready to use out of the box. - Dishwasher safe for easy cleanup. 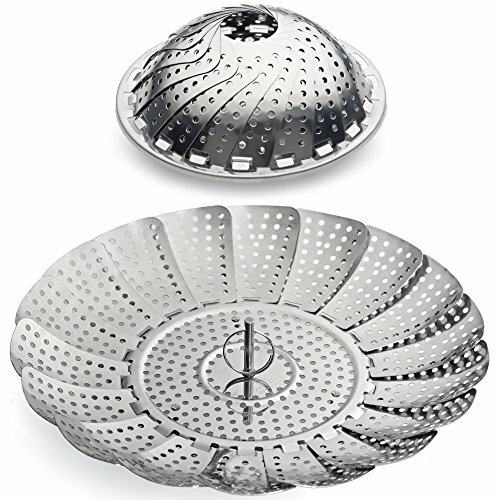 A premium quality vegetable steamer made from 100% high-grade stainless steel (including legs). Ring handle plus Bonus Stainless Steel Extension handle included. Unique design which expands to fit various pot sizes. Collapsible for space saving storage. Easy removal from pan with sturdy central ring. Removable central post screws off easily for steaming large items. Takes up less space than bamboo steamers. Diameter 5.3 inches to 9.3 inches - Height range (legs included) 2 inches to 3.4 inches. If you have any questions about this product by Sunsella, contact us by completing and submitting the form below. If you are looking for a specif part number, please include it with your message.